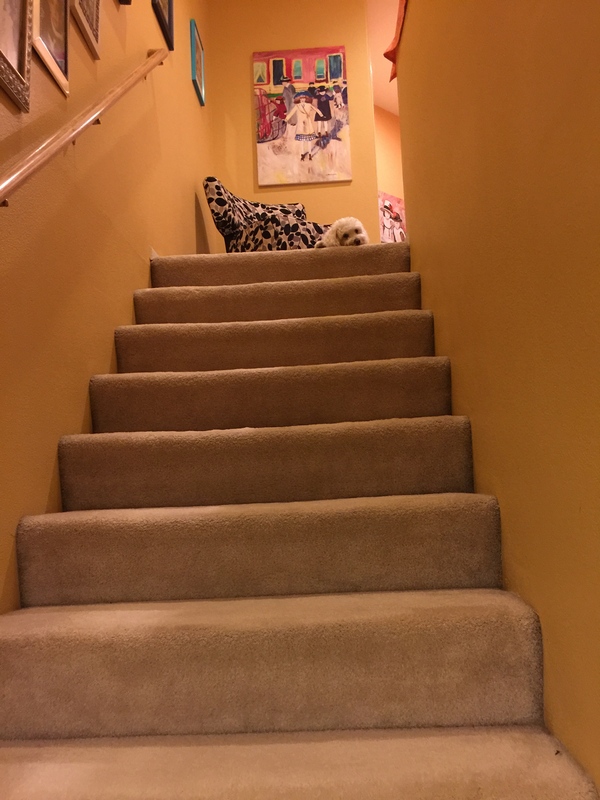 This Maltipoo has a thing for stairs. This is a true story, I kid you not. He has a thing for steps. Indeed, he NEVER is far from the stairs. 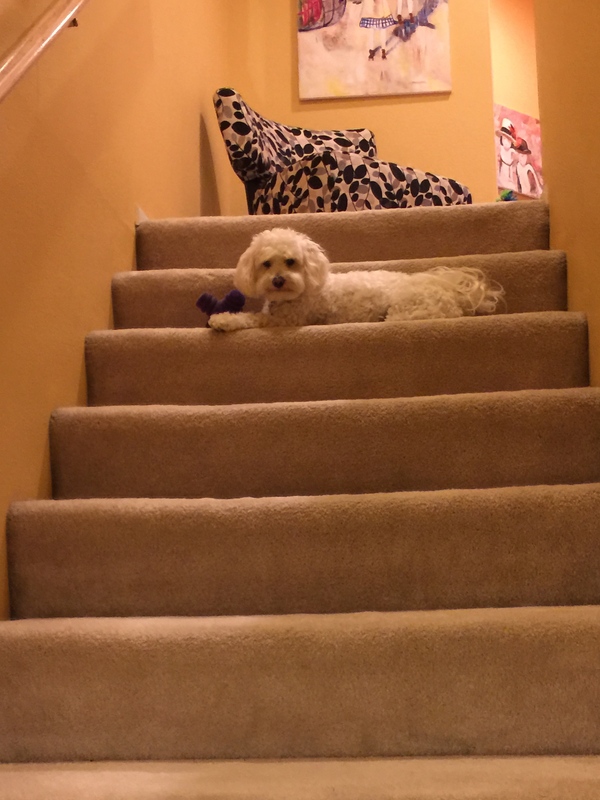 In fact, you could say this toy-sized dog lives on the stairs. 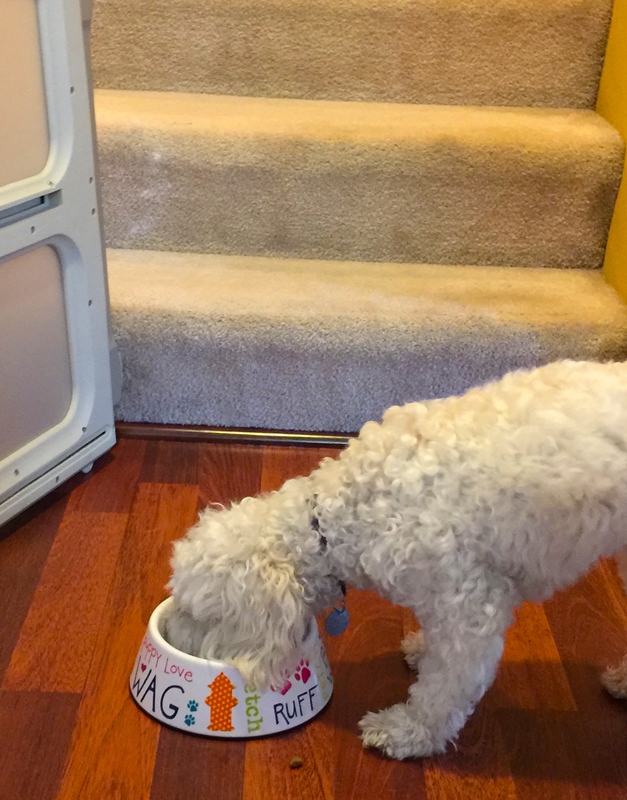 He may skitter-scatter to the kitchen for a moment to nibble on a treat, but even at chow time, he prefers to be served on the landing in-between the two sets of steps. 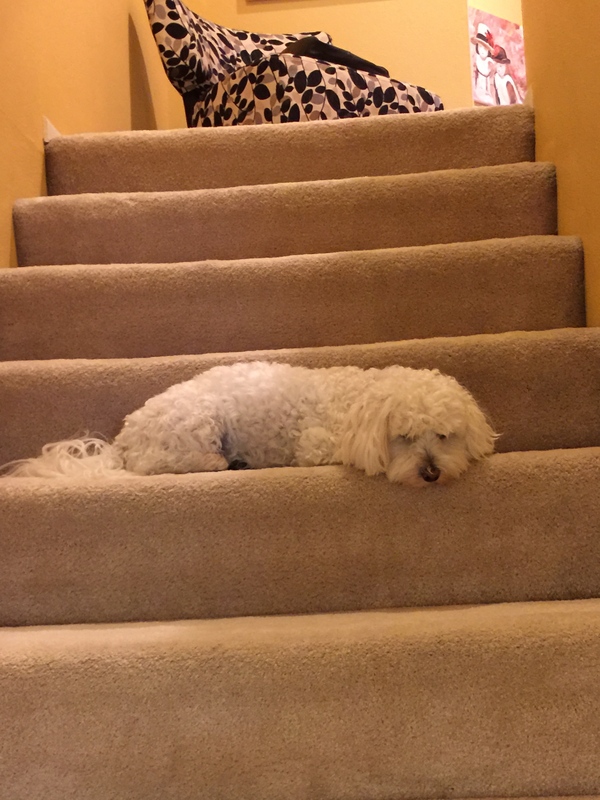 He’ll take a walk, but as soon as he returns to his little town home, he runs up the stairs, to make sure they’re still there, then stays at the top or finds a spot halfway down. He loves the staircase so much, he chooses a step and gets cozy. Why he lives on the stairs, I do not know. It’s rather perplexing, and if you have an inkling, I hope you’ll share it here. Many have pondered the mystery of the little dog who lives on the stairs, but all who’ve wondered, have come up empty-handed. It’s true, this little pup seems happiest on the stairs. 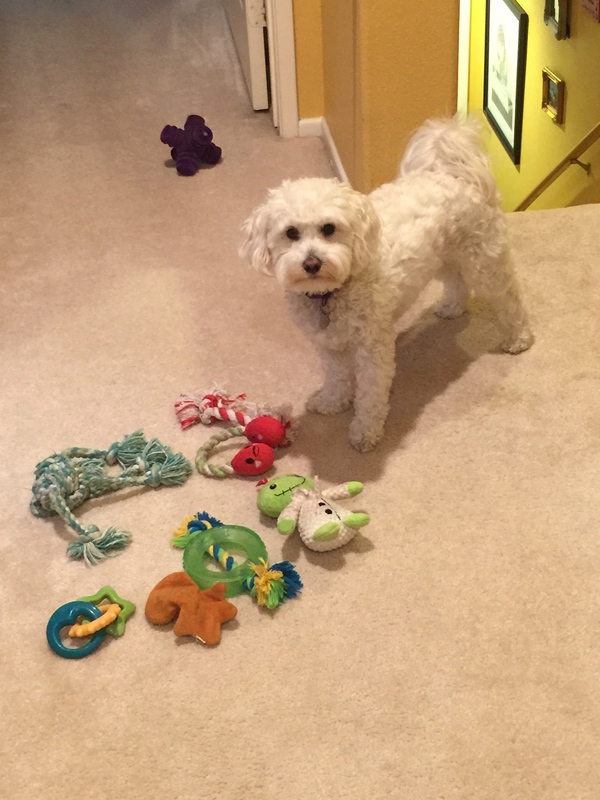 He keeps his toys on the top landing. And if you want to play with him, it’s best you look for him somewhere on the stairs. He answers to the name of Oliver. Oliver Twist, thank you very much. Sometimes Oliver hangs out near the top of the stairs. Sometimes he’s hanging out at the very top. Sometimes he’s somewhere in the middle. Every once in a while he forgets whether he wants to go up the stairs or down, so he stays like this until he figures it out. Oliver prefers to take his meals on the first landing. Again, notice his proximity to the stairs. What do you make of this penchant for stairs? All theories welcome! Gina, I think you’re on to something! It’s because of his height, or lack of it, that he stays on the stairs! It makes him feel tall! Brilliant! Thank you so much for shedding light. He’s constantly trying to walk on his hind legs which is funny. So, wow. That’s it! We spent some time yesterday with a beautiful McNab who loved the stairs so much he dropped his toys all the way down then went racing to pick them up and got my girls to throw them down until, well, he tired them out, not the other way around. One of my girls loved the stairs so much, she always wanted a house with stairs – sadly we have none. 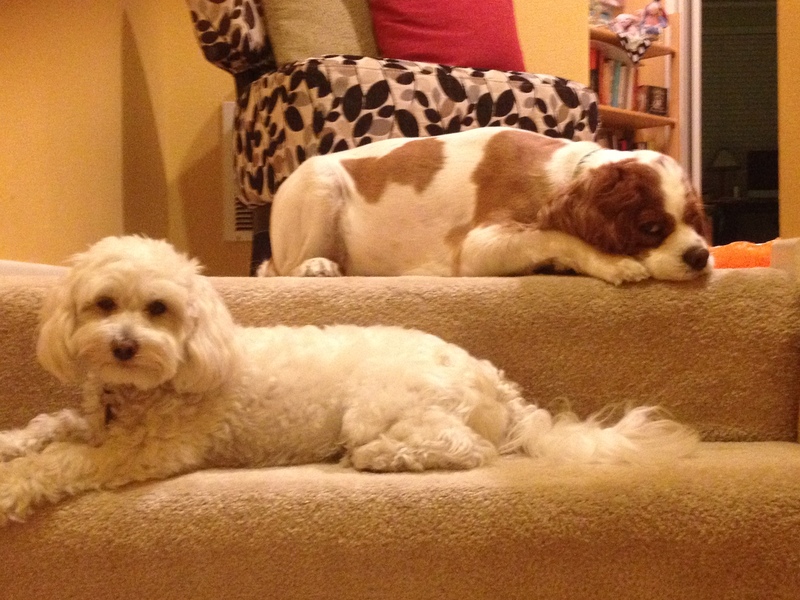 I don’t have a theory but I’m trying to figure out why dogs and children love stairs. In the meantime, lovely young Oliver and Sir Henry are adorable as always. The photos are so cute. How funny that the McNab wore your girls out! Downright hilarious! I did see it, in fact I wanted to comment on it and say Brava! I can’t even write one a week, let alone a day. I think it’s fantastic. Nothing like a challenge. I enjoy your posts as you know, so the more the merrier! I suspect this way he can get a better view! He has found his spot and you will not dissuade him. Even dogs have favorites and some, fetishes. My sister’s dog likes feet. I would say he likes seeing his coming and going and has become the honorary guard dog. You may be right, Totsy. He sometimes looks like he’s standing guard. It cracks me up, though, that he thinks he can guard us. That 12 pound lightweight is fooling no one but himself! Here you are again, Monica! Go girl! Every time I go to my reader, there’s another story. Only you can make this so entertaining. It’s amazing how you write about the very things that have crossed my mind. This reminds me of the city house with its two floors and carpeted stairs. I kept a carpet brush to constantly brush up T-Bob’s hair and avoid lugging the vacuum cleaner up and down. At night, he was on the next-to-the-top stair near our open bedroom door. During the day he was on one of the bottom stairs near the kitchen. I think it depended on where we were. Also, they didn’t get much traffic as my husband and I generally came down in the morning and went up at night. Georgette, thanks for hanging in with me on this daily post challenge. I need all the support from my readers I can muster. I know it’s a lot to ask, but I so appreciate you coming back and commenting so much, especially now that I’m posting DAILY. Without good folk like you, I’d probably throw in the towel and give up! But I really want to succeed at this goal. It’s only 30 days and I may end up taking off the entire month of December just to recover! Ah, it’s so sweet that Sir Henry keeps him company in this rather bizarre passion! Dallas isn’t much for stairs. He follows me up and down them, but if truth be told, he’d MUCH prefer I “taxi” him to level flooring, ha! And that’s just what I have to do when storms come during the nighttime hours and I need to put him in his safe crate. As for why Oliver chooses staircases, gee, I have no idea. Perhaps he’s a Libra and can’t make up his mind?? Don’t be mistaken, Henry isn’t always as gallant as that. Usually he leaves Oliver to his own devices. But here’s another quirk I’ve noticed. When taking them on a walk, Henry is always the first one out. Even if Oliver is closest to the front door, he’ll wait for Henry to exit, then he follows close behind. Interesting, wouldn’t you say? I reckon he likes the stairs because he is keen to go up in the world!!!! I used to know a chap who’s dog was a failed drug finding dog, anyway he used to climb ladders, apparently he frightened the hell out of the window cleaner one day by climbing up behind him. The dog that is not my friend!!!! 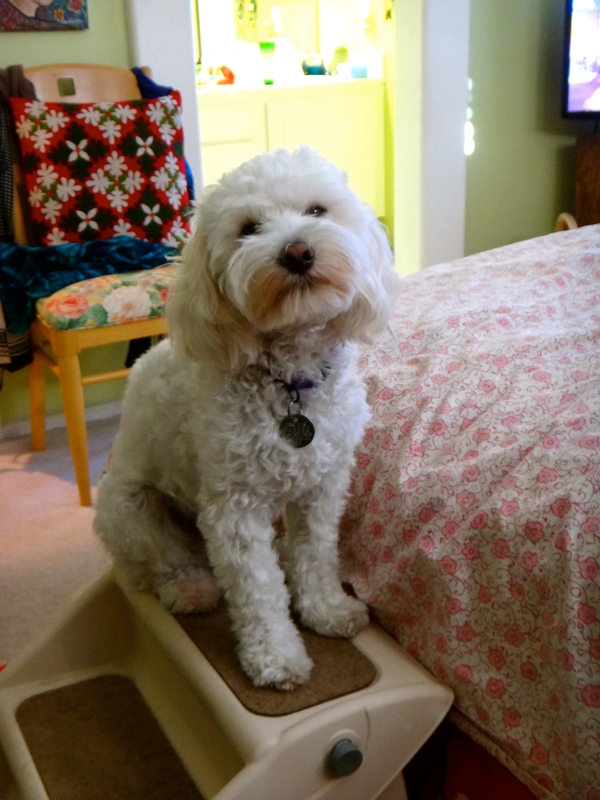 Actually, it’s quite fascinating how dogs can develop personalities all their own. There are worst things Oliver could do. 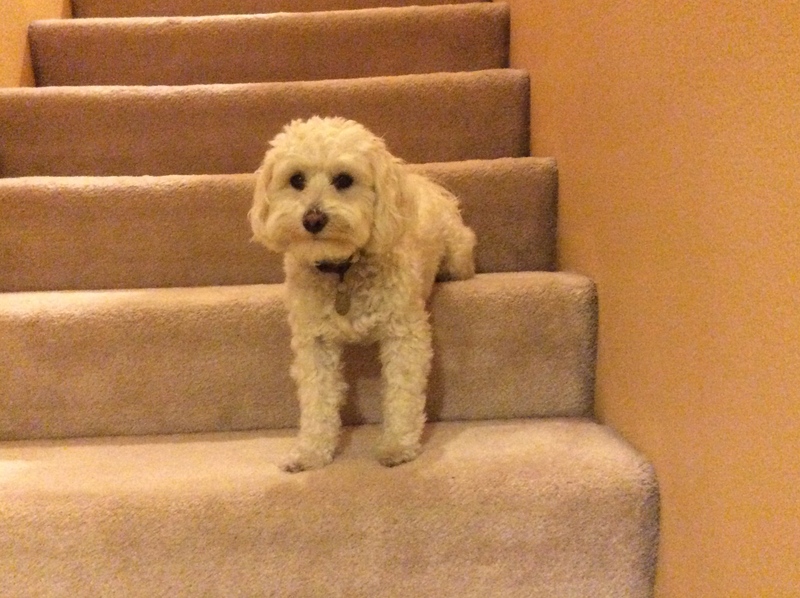 It’s kind of odd, but endearing that he likes the stairs so much.